Broken Halo IPA has been retired. W'10 is now year-round in $9 4-packs as Pitch Black IPA. Deadlift IIPA is now called Nelson IIPA (still in $9 4-packs). Broken Halo's 6-pack slot will be filled by various IPAs labeled Rotator. 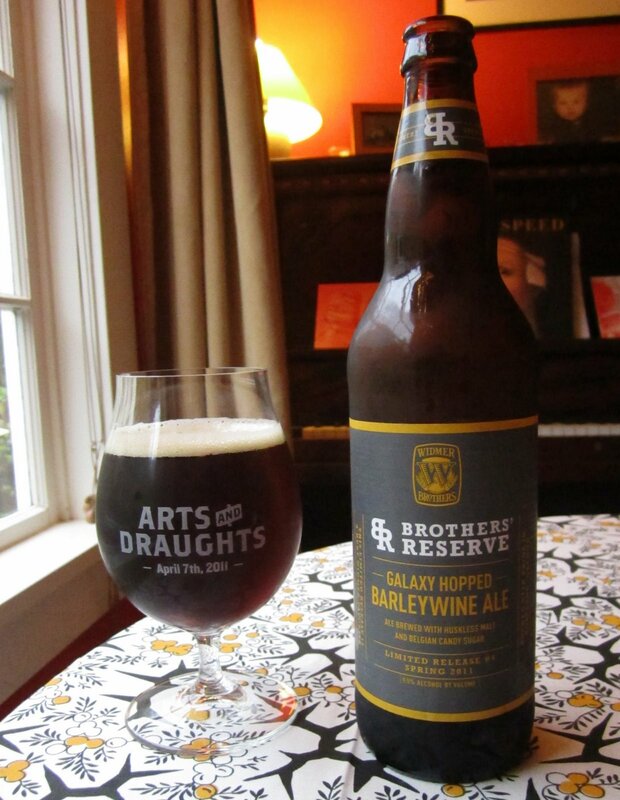 The latest Brothers Reserve is out: Galaxy Hopped Barleywine. The summer seasonal that was called Sunburn last year, is now called Citra Blonde. Let's have a brief moment of silence for Broken Halo. Born into the world as W'05, it was a satisfying, clean, middle-of-the-road Northwest IPA, made more attractive by the fact that you could often find it on sale at the supermarket for $7 or less per six-pack. I'll miss it a little, but I think Widmer made a very astute move by recognizing that tastes have moved on since Broken Halo came out, and they can stay on top of the game by releasing a different recipe of IPA every so often. It would never have occurred to me to do something like that, but once you hear it, you realize it's a smart idea. The loss of Broken Halo is amply compensated for by the first Rotator IPA, called X-114, named after the experimental hop variety that is now called Citra. An IPA by that name has been on and off at the Widmer Gasthaus for a couple years now, and I even remember seeing it on tap at Belmont Station once, but odds are that the recipe has been changing during that time. The version that's out on tap and in bottles right now is very nice. It has that beautiful orange-blossom aroma that Widmer's Drifter Pale Ale has, even though the aroma hops are different for the two beers (Drifter uses Summit and Nelson-Sauvin instead of Citra). But X-114's sturdy backbone keeps the flavor up right to the end, whereas Drifter's flavor falls disappointingly flat. X-114 isn't a barn-burner, but it's a solid IPA that I'll be indulging in regularly while it lasts. The Galaxy Hopped Barleywine that's out right now is also a treat, and well worth seeking out. It's darker than what you might be used to in barleywines (see the picture above), and has a comparatively light mouthfeel. The Galaxy hops give it a nice tropical fruit aroma; in your mouth it takes a second for the hops to kick in. They provide a kind of guava or tangerine flavor, followed by a moderately long, bitter finish. It's very smooth and drinkable: I don't get the Old Foghorn maple/alcohol kick that I usually find (and appreciate) in barleywines. It might age OK, but it seems better to drink it now while the hops are in full bloom. In the interests of disclosure, I'll note that Widmer sent me samples of the X-114 and Barleywine, though I bought some of my own X-114 both before and after receiving the freebies. Both beers are only available for a short time -- the Barleywine is a one-and-done; the brewery says the X-114 is due to be replaced by the next Rotator sometime during the summer -- and I recommend both of them, especially the cheap and plentiful IPA. I totally agree with the hop character of X-114, and that it seems different, more Widmerized, since it was on at the Gasthaus. I speculated that maybe the blend of hops in their Alchemy mixture had changed, but a Widmer insider said no. Still, it's undeniable that the brewery is developing a "house character" for hopping. Although it's not my favorite blend, it's distinctive and in my mind a nice idea. When you go distinctive, you leave the world of lowest-common denominator. Good for them. Well-spoken, Jeff. I'm not a Citra fan, but X-114 is the best use of Citra hops that I've seen, so far; any changes to their recipe have been for the better. @Jeff: They say the Rotator X-114 is also dry-hopped with Citra, so maybe dry-hopping accounts for the difference with the earlier ones. What do you guys think of last year's Sunburn summer seasonal? That was also dry-hopped with Citra, and now I'm noticing it was only 4.3%. I hope they bring it back this year. I always liked the X-114, though it may have been helped by a coolness factor, since it was only on at Gasthaus. The other brews sound very tasty. But changing the Deadlift to Nelson? Weaksauce name. Bill, sorry for the slow reply. I thought the Sunburn was a huge winner. Somewhere on my blog there's a review--if you can find it. Turns out Sunburn will be back this year with the more-appealing name "Citra Blonde". Hope Dan doesn't think that's "weaksauce". Here's a post that includes Jeff's opinion of Sunburn. Thanks for the review and compliments on the beer. We at the brewery are wishing Broken Halo a fond farewell and shedding a tear. Early versions of Gasthaus X-114 were dry hopped as well, all things being equal we should be hitting the same flavor and aroma notes. Like the Galaxy Hopped Barleywine quite a bit.. though a borderline strong ale to me, not a barleywine.